Successful musical that debuted on Broadway in 2003 - based on the story of the Witches of Oz. 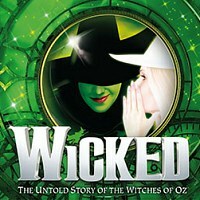 After many years rooted in the West End, Wicked frequently tours the UK. "Based on the acclaimed novel by Gregory Maguire that re-imagined the stories and characters created by L. Frank Baum in 'The Wonderful Wizard of Oz', WICKED tells the incredible untold story of an unlikely but profound friendship between two girls who first meet as sorcery students. Their extraordinary adventures in Oz will ultimately see them fulfil their destinies as Glinda The Good and the Wicked Witch of the West. "